Re: Bad performance? Post here! You won't get SMART info in tRAID, but you can get it using something like HD Sentinel. I use that program to monitor the health of my drives and it has successfully predicted the failure of 3 drives just in the first year I've been using it. That should mean it's possible for tRAID to get the information, as well, but I guess the implementation is different. I thought the same thing you did about the spin down of the drives, but I'm not so sure, since I seem to regularly hear my drives spin up. Personally, I'd prefer that they were always spinning, though. You might just need to set the advanced SMART mappings to get it to work under tRAID. That's good news. Could you try the following command in the advanced mappings in tRAID SMART: "-d sat". Also, how do you undo/change the setting once it is set? I changed that on a single drive and now the advanced options are greyed out for that device. That UI bug is fixed for the next release. I am quite lost.... I did create an array two days ago and the mean throughput to create the parity was about 240MB/s. Both controllers are equivalent, from LSI, same features/characteristic/... except that one is 16 ports (with the DRU) and the other one is 8 ports (with the PPU). Yesterday, I have deleted my initial configuration and move two disks (DRU) from their controller to the controller with the PPUs. Then, I have created a new array and started the creation of the parity. Now, the throughput in about 20MB/s and it's running since 19 hours... Only 4% has been completed ?!?!? This is incredible ?! I have only moved two DRU from a controller to another one ?! I did benchmark the disks before adding them into the array, with Windows Caching disabled. I had the same mean throughput for all disks intended to be used as DRU, being either on the first controller or on the second controller. I will abort the creation of the parity and move the disks used as DRU back to the first controller. But is there anything else that I should do/try before re-creating the parity ? One thing I plan on doing is creating a database for setup that work well for tRAID. With some many varying hardware, there is just too many variables to answer performance variances. It could be so many things including drivers. I am figuring that the speed increases depending on how may disks of (various size) are "still" used to compute the parity. Or you have a completely different approach to compute the parity (a secret ) to avoid this side-effect ?! There is something completely unrealistic with that PPU disk, no mechanical disk does greater than SATA2 speeds sequentially. Write speeds are also well below the normal. Both disks should be near identical, quite possibly may have physical disk errors. Maybe an issue with Crystal Disk Mark ? Regarding the big difference between the Read and Write, I have not idea if this is normal. But notice that I did disable the Windows Write Caching ! In addition to confirm or not that the amount of disks still used to compute the parity impacts the processing speed I am also interested to know if the maximum processing speed is limited by the speed of the slowest disk in the array ? This 1TB is a Samsung Spinpoint F2 7200RPM with a max Read speed around to 110 MB/s. My Seagate Barracuda 3TB 7200RPM have a mean Read speed close to 150 MB/s. 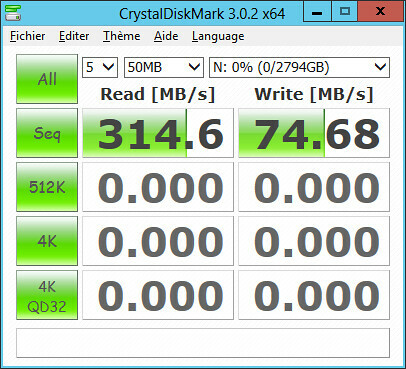 My Samsung ecogreen F4EG 5400RPM have a mean Read speed around 140 MB/s. Removing the 1TB disk should therefore boost the performances of at least 30MB/s. Right ? The slowest disk does impact the RAID tasks (Create, Verify, etc. ), but not other disks during array usage as the disks are independent. The parity of my array was created in 33 hours for 15TB of DRU* on one controller + 2x3TB of PPU* on another controller, with all default values kept for the t-RAid settings. Mean throughput was 241MB/s. Next, I did recreate the parity with TCQ enabled (but no other settings changed). Mean throughput again 240MB/s. Processing completed again after 33 hours. I have a bit of a 'weird' performance going on. The 4TB disk is just, slower for some reason. I went and tested the disk back in windows and it was reading and writing (transferring files) >150MB/sec with no problems. The two 3TB disks are in the same enclosure sharing a SATA PM and USB3 bridge, the 4TB is on the ICH10R. Oh well, I'll let it complete and see how things go. I am adding UoR's to the array. 150MB/sec is not that fast... I guess that your 3TB are faster ?! So, based on the disk perf, I decided to replace a 1TB disk with a 3TB disk in my array. And now, to create the Parity of this array (which is 2TB larger than before), it takes 30' less than before !! !